Framed for a crime that he didn't commit, Nathanial Adam was subjected to an experiment that bonded an alien metal to his skin and endowed him with the ability to manipulate quantum energy. For a time, Captain Atom was under the command of Air Force General Wade Eiling. 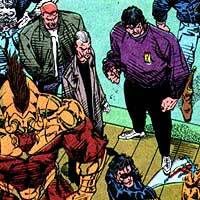 Booster Gold was already a member of the JUSTICE LEAGUE when Captain Atom was added to the League's ranks as a United States-imposed condition for United Nations sponsorship. Despite the fact that Atom has a low opinion of Booster's capabilities and discipline, he has continued to work side-by-side with Booster many times, including allowing Booster to join his EXTREME JUSTICE team. 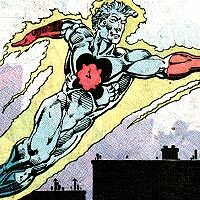 For a time, Captain Atom was engaged to be married to the villainous Plastique, who spent time aligned with Atom's Extreme Justice team. Breach was a hero who suffered a fate very similar to Nathanial Adam and was also transformed into an energy-wielding hero before apparently dying in the Infinite Crisis. During the Convergence, Booster Gold interrupted a fight between the Captain Atom and Doctor Spectro of Earth-4. Selina Kyle has had a long career on both sides of the law. Originally a burglar, her frequent run-ins and chemistry with BATMAN encouraged her to try her hand as a heroic vigilante. 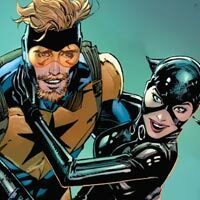 Booster Gold and Catwoman never crossed paths until her pending nuptials to Batman caused Booster to give them a wedding present. The Challengers of the Unknown were all survivors of a terrific plane crash who dedicated their remaining lives to uncovering the mysteries of the world. 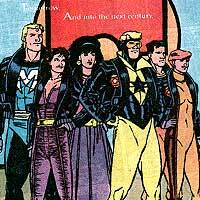 The Challengers and Booster Gold crossed paths as the heroes of Earth joined forces to combat ECLIPSO. Cameron Chase is a highly-ranked agent in the United States Department of Extranormal Operations (D.E.O.). Her natural abilities to dampen the powers of nearby metahumans have served her well in her career as an investigator. Chase and Booster Gold first crossed paths when Booster Gold crashed a TEEN TITANS press conference. While the two could not be called friends, Chase has admitted appreciating Booster Gold as one of the few heroes who has not lost his sense of humor. One of the rarest events in the lives of super heroes are pleasant get-togethers with no criminals present. 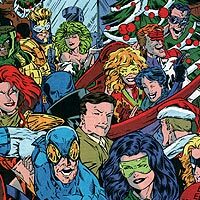 This was a rare case when such a remarkable number of heroes (well over 60 guests) could gather at Warrior's bar (see GUY GARDNER) to celebrate the holiday. Booster Gold clearly enjoys himself at this party, hobnobbing with heroes that he has never had the chance to meet in battle, though he does spend most of his time talking to his fellow members of the JUSTICE LEAGUE. When the JUSTICE LEAGUE was granted UNITED NATIONS sponsorship, the business leaders of America decided that they needed a team of super heroes to defend the interests of corporate America. Thus, the Conglomerate was formed. 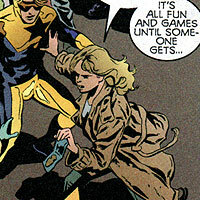 Public relations specialist CLAIRE MONTGOMERY and her associate Carl Thrunctuous were hired to develop the team and began by recruiting Booster Gold away from the Justice League. The early days of the team were spent performing tasks for the corporate sponsors, such as overthrowing dictator El Fajita in favor of El Carbonero, before the team revolted and began performing truly heroic missions including defeating corporate pawns Phil & Ernie. Companies providing sponsorship to the new team included American Steel, Dante Foods, Dupree Chemical, Ferris Aircraft (see CAROL FERRIS), LexCorp (see LEX LUTHOR), Ovel Oil, Pax Entertainment, Stagg Industries (see SIMON STAGG), and S.T.A.R. LABS. Project M is a top-secret United States military organization dedicated to creating augmented soldiers through the application of experimental biotechnology. 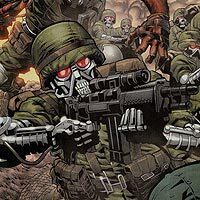 Created during World War II, Project M has created it's own army of freaks and misfits collectively known as the Creature Commandos who have time and again defended the United States from threats both terrestrial and inter-dimensional. Booster Gold found himself in the cross-hairs of the Creature Commandos following Maxwell Lord's media manipulation of the outcome of Captain Atom's battle with Magog. Investigative reporter Jack Ryder was injected with hallucinogenic drugs as part of a murder attempt. Rather than kill him, the experience created his alter-ego, the insane Creeper. When Booster Gold met the Creeper in one of his earliest missions with the JUSTICE LEAGUE, he took an immediate disliking to the crazy crimefighters. 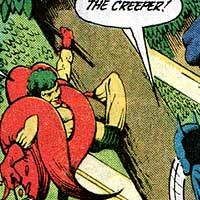 Since that time, in the few instances when they have crossed paths, Booster has been bewaring of the Creeper.